That, friends is an El-Chris-Weird-Diet-Sensitive Juicy Lucy. The meat was 93/7 lean/fat, and negligible sodium. The two patties were stuffed with cheddar and pepper jack, a touch of Sriracha sauce, two different kinds of hot pepper, and some buffalo sauce. Topped with pickle, lettuce, and tomato. Grilled to perfection. Almost .8 pounds of beef. Gosh dangit did my guts scream at me (and the people trapped in my car) today. 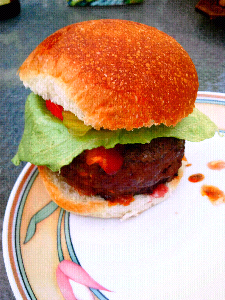 Posted by El Chris on September 11, 2012 in barbecuing, beef, burgers, cooking, recipes, summer.